Blackouts disable heating and air-conditioning systems, freezers, water pumps, refrigerators and lighting. If the power outrage lasts for any time-span, your home can become uncomfortable and perhaps uninhabitable. A backup generator can help get rid of the headaches of long-term power outages. Diesel Generator set is used to generate electricity for meeting the electricity requirement of establishments such as commercial buildings, Hotels, Telephone Exchange, Railway Stations, shops etc. when there is a power supply failure. Whether diesel generators have household or commercial use, these are the important buys and it is vital to make your selection carefully to ensure you have the perfect equipment for your requirements. It is very important to consider a number of factors while buying diesel powered generators. This particular article would help take into account some key considerations regarding purchasing generators as this would ensure we purchase the correct appliance. Regardless of what size generator you need, it is vital to shop around and do your research—prices vary greatly from brand to brand. There are several diesel generators and choosing the best one might be quite difficult. So it’s important it’s important to match the size of your generator to your electrical requirements. An undersized generator won’t last long and can destroy motors and other electrical equipment that requires more current than the generator can carry. Generators are rated by their maximum electrical power output in kilowatts. To calculate the generator size you require, total the wattage of the appliances and other items you want to simultaneously power and then double that number. If you plan to power different appliances, you should account for their starting or “surge” requirements. You can locate this information on the appliance or in its manual. Your choice of fuel and type of generator should be determined by how often you will use the generator and the fuels available in your area. Also before you buy diesel generators, perform a few load estimations to ensure your brand new machine will be able to live up to your needs. 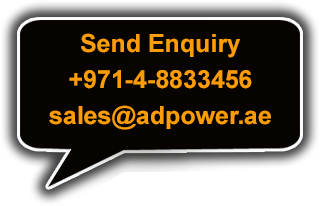 Adpower’s comprehensive range of diesel generators is ultra-quiet, compact, easy to install reliable, exceptionally quiet, compact and smooth running. The right diesel generators would be those that require low preservation and minimal care. If you are looking for an electrical generator which would see heavy use, you must watch out for what you buy. So analyzing the generator evaluations before your purchase is recommended.